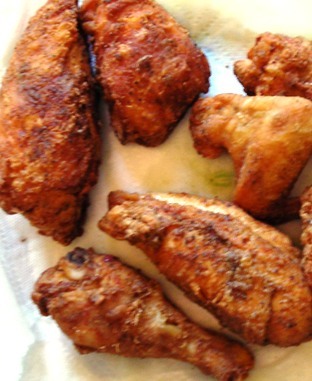 The day before you fry the chicken: Combine spices in a small bowl then spread it out over a plate. Dredge the chicken pieces in the spices. Sprinkle the garlic and lime juice over chicken and refrigerate the whole thing in a ziplock bag overnight. Pour oil in to a large pot until it is about 2 inches height. Heat the oil to 450 degrees*. Mix flour and seasoning in a bowl, then spread it out over a plate. Dredge the chicken pieces in the flour mixture and fry until each piece is a deep golden brown, about 5 minutes on each side. *tip: if you don't have a thermometer, put the oil on a medium high heat and heat for 30 minutes. For as long as I have known my husband he has been relentless in his pursuit of the perfect fried chicken. Every time he has tried something has gone wrong: the chicken is raw in the middle, it's not flavorful, it's dry, it's too dark. This weekend however, was a giant success. Flavorful, juicy chicken with a brittle golden crust. Honestly the best fried chicken either of us have ever had, any where.